I used to think that the Candy Doll Liquid Foundation was pretty useless because it's really light-weighted and doesn't offer much coverage. I was too used to BB creams and I felt that there's no need for a Liquid Foundation either. I left my CandyDoll Liquid Foundation at a side for quite some time and decided not to use it. & one fine day, I ran out of BB cream and I had to use my CandyDoll Liquid Foundation instead. When I first used it, many asked me what happened to my face. They asked if I had a breakout or something. I said I changed my foundation. They thought my foundation caused it. What they do not know is that, it wasn't my foundation, it was my face's condition all along. I was kind of depressed and determined to get a BB cream as soon as possible. 2 days later, I haven't got my BB cream as I was too busy with other issues, I realised that my face's condition improved. My pimples stopped coming out and my clogged pores issue isn't as bad as before. I felt that something was amiss so I checked online, then to realise that applying BB cream on my face everyday actually causes my pores to be blocked up thus causing pimples. Surprisingly, this thing changed my whole make-up routine. 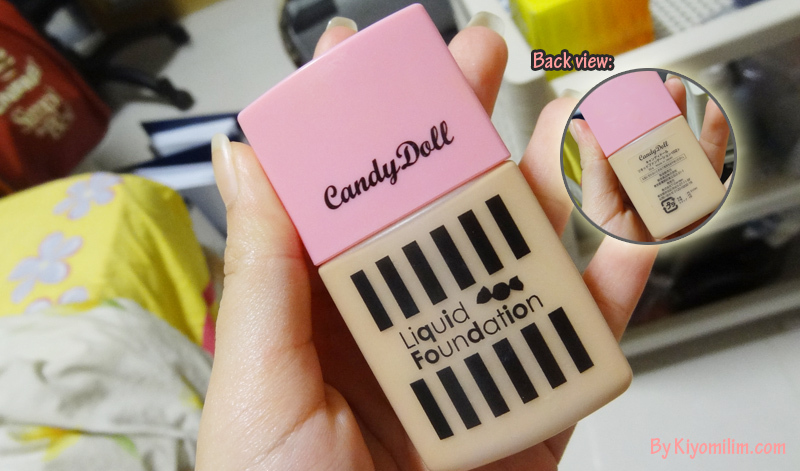 I started using CandyDoll Make-up Base with the Liquid Foundation and their Concealer (for my scars). Up till today, my face condition vastly improved and I dare not go back to my BB cream routine anymore. What's even better? Friends commented that my face looks much more natural now and not as cakey as before. I use my base 01 first then concealer 02 then liquid foundation 02 then loose powder. - This whole idea of CandyDoll liquid foundation isn't to conceal pimples or scars but to matify your face to give a natural overall look. - I love how natural my skin look afterwards and I really like how light-weight this liquid foundation is. - This foundation covers redness really well though it doesn't conceal pimples/scars. - As it is very light, it glides on your skin very easily. - Very even application especially applying with a light pat on places that's usually redness-bound. - Very natural for 02, 01 is very light and 03 is very dark (for dark/sun-tanned skin). - The reason I rate it 4/5 is because it's quite hard for you to choose between 01/02. It really depends on your liking towards the shade for your face. The colours are quite different between 01/02/03 and nothing inbetween. - This is because the coverage issue isn't a problem for me. Many of you may think that it is important but a concealer solves it all. If you have a pimple, try not to apply too much make-up on that area too. - I love how it doesn't clog up much of my pores compared to my BB so I'll give it a higher rating. *Not biased just because I love Masuwaka Tsubasa! Haha. So that's it for my review and hope you all have a nice day! Tsubasa's shade is somewhere in between as well. You can mix the two to get your shade! thanks for the review! sadly my colour is between a 1 and 2 ): sometimes 1 too bright yet 2 is too dark... i also love bbcream alot since it offers good coverage but it does clog up and after long hours will make the face look slightly thick and grey.